The beauty of sheet rock (also referred to as drywall), is that it’s very easy to repair. With just a few tools and materials, it is a job that can easily be accomplished by the average homeowner; leaving the wall as if the damage had never occurred. 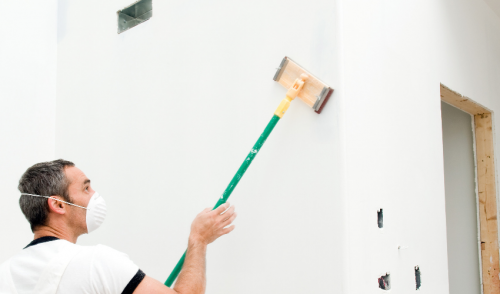 The perfect time to repair your drywall is when you plan on repainting the room anyway. Therefore, before you start a painting project, first take the opportunity to inspect your walls for damage so you can make your repairs prior to painting. There are situations, however, when damage occurs and needs to be addressed. Maybe you were moving furniture and a corner of the table knocked into the wall, or perhaps a door was swung open with a little too much enthusiasm. Below, we’ll discuss common types of damage you can run into and the best techniques to make your walls look as good as new. Joint compound: This is usually pre-mixed and is available in sizes that range from small 1 pint containers to large 5 gallon pails. Drywall knives: Depending on the size of the damaged area, you may need any size from a 1 inch putty knife up to a 12 inch drywall knife, or even a corner trowel. Tape: Choose from fiberglass mesh tape or traditional paper joint tape. Nail holes and pinholes are usually left behind from pictures, mirrors and other wall hangings, and are simple to fill. First, though, it is best to carefully tap over the hole with a hammer to create a shallow impression. Another technique when dealing with nail holes is to cut the opening of the hole at an angle with the utility knife, removing any flared out edges of the drywall paper. The goal in either case is to keep any imperfections from sticking out of the wall’s surface so that a smooth, even layer of joint compound can be applied. Next, using a 1 to 2 inch knife, spread a thin layer of joint compound over the area. Allow it to dry overnight. Joint compound will shrink as it dries, so you will most likely need to skim another layer over the “sunken” hole. Next, sand with a fine 120 grit sandpaper. Take care not to rough up the surrounding surface. Finally, dust the area before painting. Nail-pops can’t be cured by simply adding more joint compound and a layer of paint. First, you’ll need to pull the nail out with a pair of pliers. Be careful not to damage the surrounding area. If you need to use a hammer to pry the nail out, protect the drywall by placing a thin layer of wood behind the hammer as it presses against the wall. Next, drive 1 drywall screw about an inch above the hole and another screw about an inch below. Be sure to countersink the screws into the drywall. Now, follow the procedure mentioned above for fixing nail holes to complete your repair. Small holes and cracks can be fixed with a couple of thin layers of joint compound and some light sanding with fine grit paper. Follow that by dusting the area and painting. Large holes and cracks will need to be patched with more than just joint compound. One technique is to square off the hole with a keyhole saw and draw a matching square on a piece of drywall of the same thickness. On that same piece of drywall, add a 2 inch margin around your shape and cut out your patch. Turn the piece over and remove the entire 2 inch margin area, preserving only the face paper. You should end up with a square of drywall that will fit into the hole, but the face paper will overlap the hole by 2 inches on all sides. Spread joint compound around the outside of the hole and place your patch into the empty space, flattening out the overlapping face paper into the compound with a drywall knife. Feather out the edges and let it dry overnight. Next, sand the area lightly and apply another coat of joint compound, using a larger knife. Let dry, then sand, dust and paint. If the damaged area is simply too large, the best plan of attack is to cut the section out, back to the nearest studs. Find the center of the studs on both sides and cut the drywall up the center of each stud, at an equal length. Using a square, measure lines across the top and bottom of your vertical cuts to form either a square or rectangle, and cut out the section. Remove your damaged piece and replace with a patch of drywall of equal size and thickness. Screw it in place and apply joint compound to the seams, followed by joint tape. Allow to dry, then sand, recoat with compound, re-sand, dust and paint. As you can see, with a little time, patience and the right tools, your damaged walls can have that “just move in” look in no time. For all of your drywall needs, whether it’s the tools, materials or advice, feel free to call or stop in and our knowledgeable staff will provide you with what you need to make those unsightly dings, dents and cracks disappear.